Patient flow for MAPS stent substudy. FU indicates follow-up; UIA, unruptured intracranial aneurysm; SAC, stent-assisted coiling; CA, coiling alone; WNA, wide-neck aneurysm. 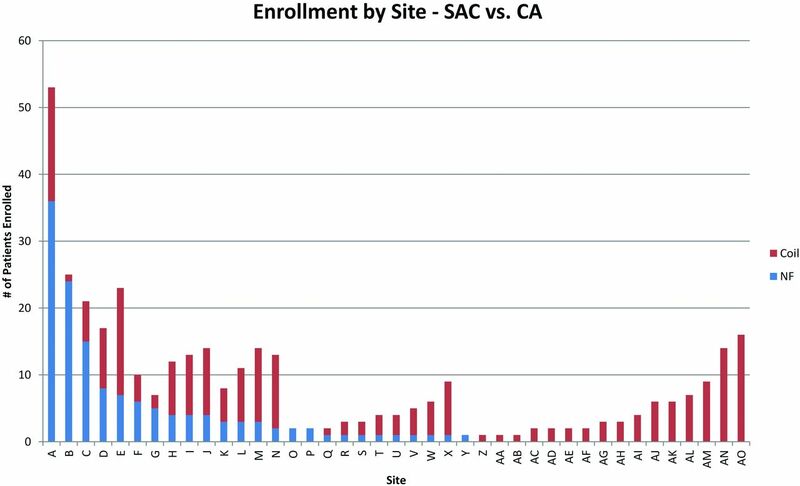 Stent use by enrolling site. SAC indicates stent-assisted coiling, CA, coiling alone, NF, Neuroform stent. Note:—CVA indicates cerebrovascular accident; NA, not applicable. ↵a Cerebrovascular risk factors include hypertension, hyperlipidemia, coronary artery disease, and diabetes mellitus. ↵a No antiplatelet use recorded in these subjects: for an individual subject, this could mean no aspirin or clopidogrel was used or that data are missing. ↵b Core lab occlusion assessment for the 81% of patients who had assessable angiograms after the procedure. ↵c Core lab occlusion assessment for the 82% of patients who had assessable angiograms after the procedure. 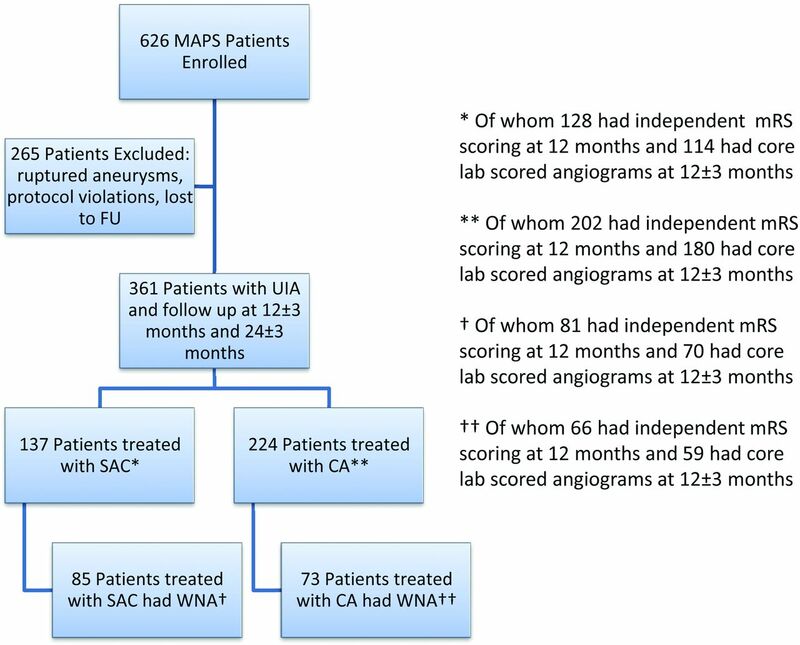 ↵a One enrolling site accounted for 5 of 12 subjects with ischemic stroke in the unruptured aneurysm group. All ischemic strokes at that site occurred ≥7 days after the procedure. ↵a Twelve-month mRS scores were available for 128, 202, 81, and 66 patients, respectively, across all subsets. Note:—81% of subjects in the “all unruptured aneurysms” group and 82% of subjects in the “wide-neck aneurysms” subgroup had angiograms assessable by the core lab at 1-year follow-up. Note:—Complete data on ischemic stroke rates were included in predictor analysis, including data from all enrolling centers. Note:—Complete data on target aneurysm recurrence rates were included in predictor analysis, including data from all enrolling centers.